Recently we were sent a few rather splendid Terra Rossa-Arabian specialities to try out. Along with The Essence of Gourmet Ingredient - Terra Rossa olive oils, we were also sent their Zaatar mixes and delicious finger licking hand made sauces and dips!! The Terra Rossa ( Red Soil ) region, which is a biblical name, is given to the part of the Middle East where olive trees are planted. I am sure many of you are drooling already whilst reading this post and wondering what IS Zaatar mix, and how do you eat it? Zait & Zaatar is arabic for Extra Virgin Olive oil & Thyme Mix. Basically in the Middle East, people have bread, any flavoured extra virgin olive oil and any herb mix as a breakfast or snack. Consider yourself lucky to get all these exquitisite Terra Rossa products in UK. All the products are available online. 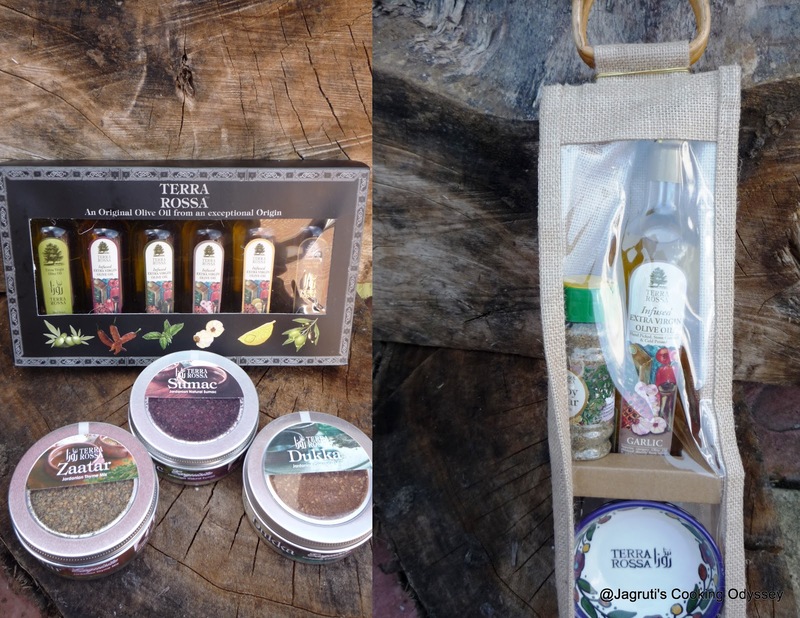 Terra Rossa products make ideal gifts for foodies as they are presented in chic, fancy packaging. The box containes herby mixes such as Zaatar ( made from thyme, sesame seeds and sumac )..Dukka ( made from coriander, sesame seeds and sumac ) and Sumac ( a lemon berry ). It was delicious and a real treat with flavoured extra virgn olive oils and crusty bread. We particularly liked Zaatar. They are not only delicious on their own but you can make perfect dips from them too. Use as seasoning, sprinkled over salad, houmous, yogurt and vegetables. Mixed with cheese to make bread, pizza and paninis or use as a dressing and drizzle over pasta, fish or chicken. By introducing these mixes to your meals give your regular food a whole new dimension..! Also, we had UK hand made sauces and dip jars such as Dukka Harissa, Aubergine and Tomato Relish and Zaatar & Pine Nut as well. I would say they were the highlight of the Terra - Rossa products. So fresh, exotic, pure vegetarian and made from the finest ingredients. The only preservative used is olive oil. They go extremely well with any bread or toast as a dip, and you can also use as a pizza base, poured over jacket potatoes or simply stir through boiled pasta. Great for a marinate too. Me and my family loved all the dips and we are adding another way to finish these dips and sauces..have it with tortilla chips..the combo of mexican and middle eastern flavours was tantalising !! Thank you very much Hanan ( Terra -Rossa products sole importer and distributers in UK ) for sending me these awesome products. Good luck for your venture !! Arabian Cuisine is very popular in Brazil and we get a lot of these products here. Some of the dishes are really amazing.